We serve volunteers across a wide range of sports. Most of our customers have between 50 and 500 participants per year. 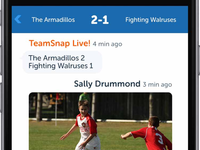 Our web and mobile apps help teams, clubs, leagues, associations and and other organizations that need to save time with communication, scheduling, registration, rosters and more!